At the outset, I must admit that being a fan of the Director Rohan Sippy there will be a certain amount of bias in this review. I like his distinct style, the attention to details in certain aspects, the monsoon Mumbai captured in his movies and the hatke music. Alas, despite so many things going for him rarely do his movies set any benchmarks. His best work, so far was ‘Bluffmaster’ and sadly even after watching his latest ‘Nautanki Saala!’, it will still be the Abhishek-Ritesh comic caper that shall remain his best work. All said and done, I will still stick my neck out and say that ‘Nautanki Saala!’ is worth a watch. It has genuinely funny moments especially in the first half and the combined comic timing of the lead actors, Ayushmann Khurana and Kunaal Roy Kapoor, will ensure some of those will replay in your head even after walking out of the theatre. The movie begins with theatre actor-director Ayushmann (Ram Parmar/RP) saving Kunaal (Mandar Lele), a loser-ish no gooder from committing suicide. Being the Good Samaritan and this being a movie, RP brings Mandar home, much to the annoyance of his live-in girlfriend. It turns out that Mandar was on the verge of suicide after being dumped by his girl Nandini Patel (played by Pooja Salvi). How a girl as pretty as Nandini fell for a loser like Mandar is best left to the viewer’s imagination. Maybe the explanation lies in the dumbness of her character which the writer’s establish through the rest of the movie. The fact that her character also turns out to be mega irritating though is purely because of the nonsensical acting skills of the debutante actress. RP attempting to ‘play God’ embarks on a mission to bring back the two together but in typical Bollywood fashion ends up falling for the girl himself. The movie unfolds as the comedy of errors against the backdrop of a play ‘RaavanLeela’ with RP playing Raavan and Mandar as the completely out of place Ram. Here I must pause and give special mention to Evelyn Sharma, the hottest Sita ever in a Ramayan play. One can never add ‘maate’ as the suffix for a Sita played by her. The humour in the first half is subtle and terrific with characters like the producer of RP’s play and the Malayali hospital receptionist bringing out enough laughs to keep you engaged. It is the second half that is the primary reason this movie will not be appreciated universally, especially the portions around the sad songs. The movie regresses into unnecessary melodrama devoid of any logic with Pooja Salvi acting so badly that you wonder if it was spoof that Rohan Sippy was trying to pull off. 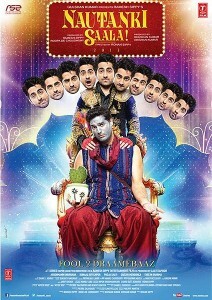 Thankfully, the lead actors Ayushmann and Kunaal do not suffer from any such acting amnesia. They are both terrific with the former carrying on from where he left in Vicky Donor playing his character with casual ease. Somehow cannot imagine him playing the kind of romantic leads that say a Ranbir or a Shahid play, but Ayushmann has enough natural acting talent to build a strong and loyal fan base. I am already keenly awaiting his next. The music by Falak Shabir, Mikey McCleary, Rashid Khan and others (including Ayushmann himself) is peppy, interesting and lively with the remix of Dhak Dhak being my favourite. The background score (Mikey McCleary) and cinematography (Manoj Lobo) blend brilliantly well with the Director’s smart sense of humour. As mentioned in the beginning, this is not his best work but still worth a watch purely for the laughs the lead duo will bring out. The Director certainly knows the art of understated humour that the intelligent audience will appreciate. On a scale between that ranges between Seinfeld and David ‘Slapstick’ Dhawan of recent times, Rohan Sippy definitely inclines towards the former. Rating: 3/5. Maybe the extra 0.5 is for the bias I have but this one is still 2 hours well spent on a weekend. It will lighten your mood up. Go for it! In what has been described as one of the longest on screen kissing scenes in recent times featuring Ayushmann and Pooja, I happen to notice the paint applied on the pillar against which they lean. The texture paint finish is called vertical scratch. And now I have ensured you do not miss it either. Incase you are wondering, I work for a company that sells paints.